I sent this initial charm back as it was a tiny bit larger than the 14k charm that Overstock was no longer carrying. I should have kept it as I have not been able to find another in 10 or 14k. All carat weights and measurements are approximate and may vary slightly from the listed information. *T.W. (total weight) for 1/6 carat T.W. may range from .13 to .18 carat. Treatment code N. See Treatment Guide for further information. This was purchased as a Mother's Day Gift for my lovely wife. I was a little skeptical because the picture doesn't really give all of the detail, but ordered it anyway. The Pendant itself is actually not bad. The diamonds are pretty uniform, albeit small, but that was expected. A little disappointed the the sparkle of the 14kt version isn't there, but that one was sold out! The chain this arrives on must be replaced with a stronger one. We recommend the Foxtail chain Overstock carries---it looks amazing when paired with this pendant! Are you kidding? I love my necklace!!! For what I paid, it is high quality. It looks beautiful, can be worn everyday and is the perfect size. The diamonds are pave and beautiful. I recommend this for anyone! I got my initial pendant a few weeks ago and I have been wearing it since it was delivered. The pendant looks great on me. The quality of the diamonds is really good and the chain quality too. It's a great value item. I ordered this necklace to give as a graduation present for my granddaughter. She wears only silver and white gold. The initial is very dainty and just the right size. The diamonds, while small, have lots of sparkle. I was very pleased with this purchase. I ordered "M" and was thrilled to receive it today. It is just perfect. A male reviewer recommended the foxtail style w/g chain to purchase from "O" for this pendant. It really makes the pendant pop. I got the chain yesterday and tried it on other pendents that had small bails and it fit. The loop (finding) on the one end was small enough to slip through all of the pendants. Before this new chain, I had to keep the thin skimpy ones on these. Overstock is good value. I purchased the initial pendant for my best friend's 40th birthday. She is a petite woman, so when I received the pendant, I was pleasantly surprised. The diamonds were quite sparkly and looked like I had spent more money than I actually did.. The cursive style of the letter "A" was perfect. The only two things I would change are the chain (too flimsy for the pendant) and the ring that the chain goes through - it was too large, looked clumsy. My father bought me this pendant for my birthday. He heard me telling my mother I wanted one and decided to surprise me before my birthday with it. I was so happy and came directly here to review the item. It's a stunning piece. My daughter has been driving me crazy with this pendant. I finally decided to come online to see what all the fuss was about. After reading the specs, I decided to buy it. How could I possibly go wrong, it's really low priced. The pendant was delivered quickly and I am really happy with it's quality. The diamonds, although small, look really clear and they are shiny. The pendant is well assembled. I love it, it is not perfect, but if worn on a shorter chain somehow it looks better. I wish it would be shinier. 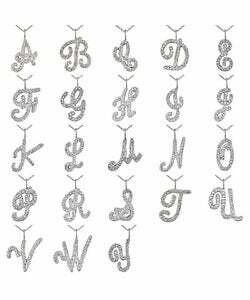 But all my friends love this pendant, they complement it and I would buy it for them (as a gift) if there would be an appropriate letter. Bought this as a Christmas gift, and wished I bought one for myself. Very nice and delicate. Some reviews comment on the chain, but I like delicate chains; very feminine. I wear this necklace quite often. Very pretty and sparkly. Love it! Definitely reccomend it. Substantial piece, stones are bright. I bought this as a replacement for the one I lost...I orginial I had for years....no diamonds, just gold. My husband said when I bought it...it looks small...but I wanted it anyway. Well, I have received so many compliments and the quality looks superior....I love it...The gold feels solid... I love it. The initial is good size and shines beautifully. I was very pleased when I opened it. 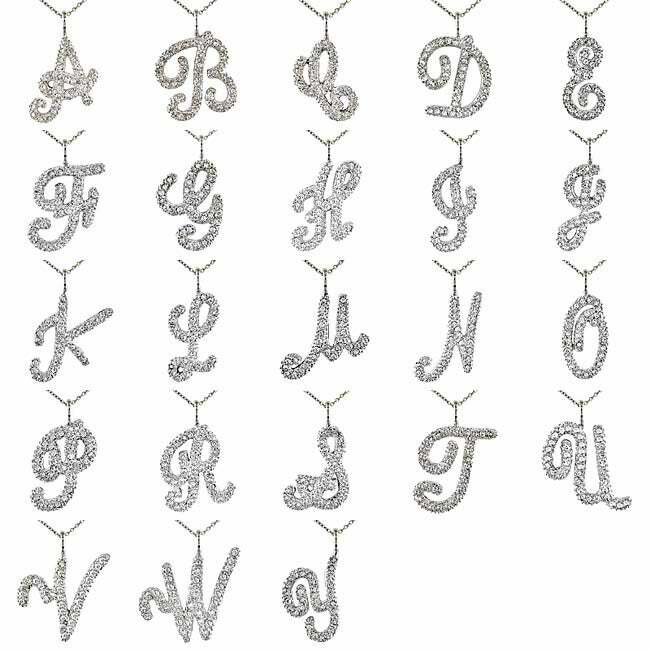 "Does each letter come with a necklace"
No, you would select a letter.